COMMENTARY – After eight weeks, there is finally starting to be some separation in the Pac-12 standings. The state of Washington is dominating the North, with both Washington (7-0) and Washington State (5-2) having identical 4-0 conference records (putting them two games or more ahead of everyone else in the North). In the South, Utah (7-1) is tied with Colorado (6-2) with 4-1 conference records (owning a one game or more lead on the rest of the South). Needless to say, this has been a very entertaining season so far. The Pac-12 preseason media poll predicted Stanford would beat UCLA in the conference title game. After eight weeks, Stanford has a 2-3 conference record (4-3 overall) and is in fourth place in the North. Meanwhile, Washington is undefeated in both conference and non-conference play and is knocking on the door of making the college football playoff. In the South, UCLA has a 1-4 conference record (3-5 overall) and is fifth place in the South. The mighty Utes and the Buffaloes are the top dogs in the South. There have already been a lot of surprises so far and there is still plenty of football to play. Speaking of surprises, Utah running back Joe Williams is probably the most intriguing story the Utes have had this year. Coming into the season, Williams was the starting running back, but he struggled in the first couple of games. He ran fairly well, but multiple turnovers gave the other running backs behind him a chance to flourish and perhaps it shook his confidence a bit. It was then that Williams retired from football. There are multiple possible reasons for this, but his stated reason was that his body was worn down and he was ready to move on from football. Utah continued on and a number of good running backs played well in the following games. That is, until the injuries started. 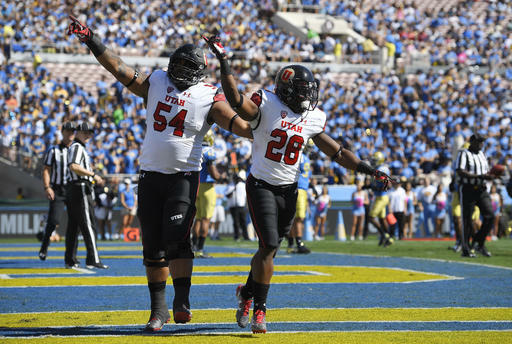 It didn’t take long until the Utes had few options and were on their sixth-string running back. After getting approval from the team first, Kyle Whittingham then went to Williams and asked if he would return to the team. He did, and last week at Oregon State he was the main story as he ran for 179 yards and one touchdown after not playing football for nearly a month. As it turns out, that was just a glimpse of things to come. This past Saturday at the Rose Bowl, Williams unleashed his fury against the Bruins, running for 332 yards and four touchdowns (after rushing for only 75 yards in his first two games combined this season). Williams’ 332 yards set a new school single game rushing record (surpassing previous record holder Mike Anderson and his 254 yards against Fresno State in 1999). Whatever the reasons for Williams retiring earlier in the season, he is now back and he is playing incredibly. If he continues at this pace, rather than prematurely retiring from college football this season, he could be playing in the NFL next season. Absolutely amazing! Let’s go Joe! This Saturday, with a 1:30 p.m. kickoff, the matchup of the season is coming as fourth-ranked Washington comes to Salt Lake City. This could very well be a preview of the Pac-12 championship game. We’ll see if the struggling Utah secondary can get it together and play well against the high-flying Huskies’ passing attack. It should help that the Utes are playing in the friendly confines of Rice-Eccles Stadium. The 7-1 football team isn’t the only thing to be excited about right now. The Runnin’ Utes 2016-17 season is right around the corner. On Oct. 18, Utah had its traditional “Night with the Runnin’ Utes,” featuring an intra-squad scrimmage among the men’s team. 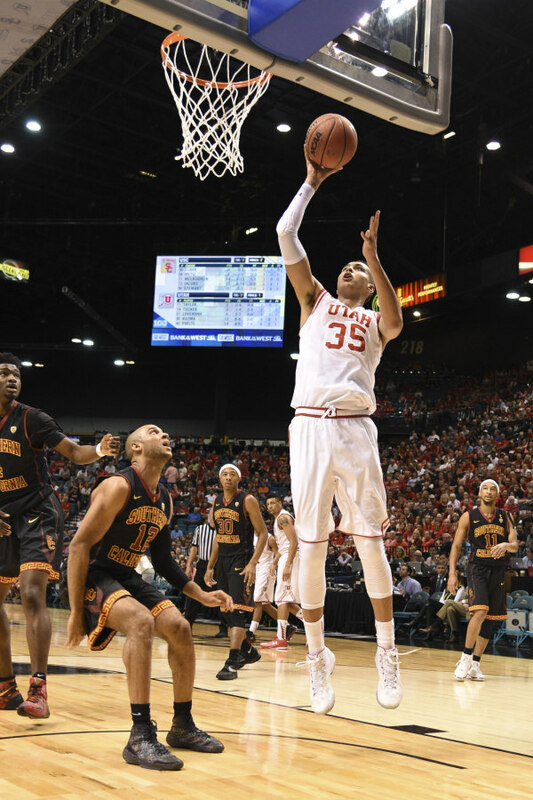 Utes forward Kyle Kuzma (35) is one of just five returning players for the Runnin’ Utes. | Photo courtesy Utah Athletics. This season, Utah brings back only five players. With only two of those (Lorenzo Bonam and Kyle Kuzma) getting significant playing time last season. The rest of the team either graduated or transferred. However, there is no need to fear. The new look Runnin’ Utes are athletic, long, energetic and ready to hit the ground (wait for it) running. There are three new players in particular that promise to play significant roles in helping to keep Utah competitive and near the top in the Pac-12 this season (despite being predicted to finish eighth by the media). Sedrick Barefield is a sophomore point guard transfer from SMU who has great ball-handling skills, excellent speed and silky smooth moves around the basket, reminiscent of Delon Wright. He is not eligible to play until Christmas, but he should be one of the top Runnin’ Utes this season. David Collette is a 6-foot-8 forward from Murray, Utah. Collette transferred to Utah after playing for Utah State last year. He, too, won’t be around for the first few games, but he has a lot of power and strength that is going to be very useful to the Runnin’ Utes defense. And finally, Devon Daniels is a 6-5 guard who is an incoming freshman from Justin Siena High School in Michigan. He’s got length, he’s got athleticism and he’s got the hops to be a great offensive weapon. If he doesn’t steal the starting spot from Gabe Bealer, he will be one of the best, if not the best, bench player that Utah will have this season. The Runnin’ Utes start their season off with a home matchup against NW Nazarene on Saturday, Nov. 12. Here’s hoping Utah puts on a show for its national audience this weekend as ESPN’s College Gameday comes to town to highlight the showdown between the Utes and the Huskies.